Made of fine quality polycarbonate, flexible, anti violet ray lens and long-lasting frame. It has fashion and unique design. 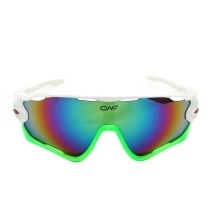 Adopt super light and tough TR90 glasses frame, do not lose color. The length of the mirror leg can be adjusted as needed, and it is not easy to break. Anti-skid adjustable nose support design, more comfortable to wear. Equipped with mirror rope to prevent the glasses from falling while exercising. It&apos;s a great gift for your friends or yourself.